If you’ve experienced any kind of long term breathing or reflux concerns, a wedge pillow may be a figurative and literal life saver. When you can’t breathe, falling asleep can put you at a particularly vulnerable position and positioning yourself the right way may be the trick to getting a good night’s sleep. Of course, the uses for a wedge pillow don’t end there; they can be particularly helpful for a leg injury or pregnancy as well. Propping the offending body part – your over-sized and uncomfortable belly or the injured leg – can lead to a more restful night and a more pleasant day. Finding the wedge pillow to meet your specific needs, though, can be a daunting task. So let us take some of the pressure off and do the homework for you. We’ve also reviewed the best memory foam pillows in a separate post. We reviewed dozens of wedge pillows to identify the best of the best. We looked at wedge pillows that can be used to improve your nightly sleep apnea and snoring and those that are designed more for a chronic case of GastroEsphophigal Reflux Disease. We also found excellent options for your more temporary conditions; injuries and pregnancy to be specific. No matter what your need for a wedge pillow, we have the right one for you. If you’re looking for a wedge pillow that will help you sleep, look no further than the Medslant Acid Reflux Wedge Pillow. Throughout our research, the Medslant Acid Reflux Wedge Pillow kept standing out as the obvious choice for our top pick. The Medslant Acid Reflux Wedge Pillow has everything you could want in a wedge pillow and then some. It’s a gradual enough incline that you wont’ mind sleeping on it every night and the dual layer will have you as comfortable as possible. The Medslant Acid Reflux Wedge Pillow will elevate your head up to 7 inches, allowing you to get some relief from GERD, snoring and all manners of health concerns. It comes with a removable and machine washable microfiber pillow case that won’t shrink or lose shape so every time you put it on the wedge, it’ll fit just right. This pillow is also CertiPUR-US certified which means it will make your body and your conscience comfortable. In fact, the list of negatives the manufacturer has taken strides to eliminate during production is quite extensive. There are no PBDEs, TDCPP, TCEP (Tris) flame retardants, mercury, lead, or other heavy metals, formaldehyde, phthalates regulated by the Consumer Product Safety Commission and it even has a low VOC (Volatile Organic Compound) emissions for indoor air quality. Now that’s an environmentally conscious and safe wedge pillow! With nearly 2,000 customer reviews on Amazon, the overall rating of this pillow, 4.5 stars, is all the more impressive. Impressive enough that we can give this recommendation as a pillow that can help you sleep and ease your pain. If you’re still struggling to find a comfortable sleeping position, the FitPlus Premium Wedge Pillow is definitely worth a try. The FitPlus Premium Wedge Pillow is wonderful for acid reflux, heartburn, snoring and so much more. Its incline will relieve some pressure off of your back and soothe your congestion if you’re sick. (Which is a reason to have it on hand even if you suffer from none of the other issues.) It comes with a pillow case that is removable and machine washable so you won’t need to worry about any of your messes sticking with it. The top 1.5 inches of this wedge is a premium memory foam that will let you sink into your most comfortable position while the pillow conforms to your body. The remaining six inches are a higher density polyurethane that will make sure you don’t sink too deeply and you maintain a healthy and supportive incline all through the night. There are over 1,400 customer reviews on Amazon for this pillow and it has an overall rating of 4.3 stars; not too shabby. There’s every reason to expect you’ll be satisfied with your purchase. The Brentwood Home Zuma Therapeutic Foam Bed Wedge Pillow is an excellent choice for a wedge pillow that will let you sleep without needing to stress the money you spent on it. The Brentwood Home Zuma Therapeutic Foam Bed Wedge Pillow has a gradual slope that will support you whether you use it to sleep or to sit up. It has a removable cover that you can unzip and toss in the washer whenever you want and that pillow case and the wedge itself were both made in the US, so you know you’re supporting American manufacturing and production with this purchase. This pillow has a very reasonable length and width; you’ll easily be able to use it without encroaching onto your bed partner’s space. Its height is dependent on your choice – and that will be determined by your preference and with what you want the pillow to help. The slighter heights may be more your speed if you want a wedge for daily use; it can prove a bit less intense and more comfortable long-term. A higher incline may be perfect for more serious issues or temporary ones; the congestion of a cold can mess with your sleep and a steeper incline can fix that for you. Almost 500 customers went onto Amazon after making this purchase to give it an overall rating of 4.2 stars. Not only that, but for a memory foam pillow, you can pick this up for only $35 and that is an absolute steal! The InteVision Foam Bed Wedge Pillow can help you sleep, even when your reflux or GERD are flaring up. The InteVision Foam Bed Wedge Pillow has a top layer of memory foam that will let you sink in comfortably as the pillow conforms to your body. 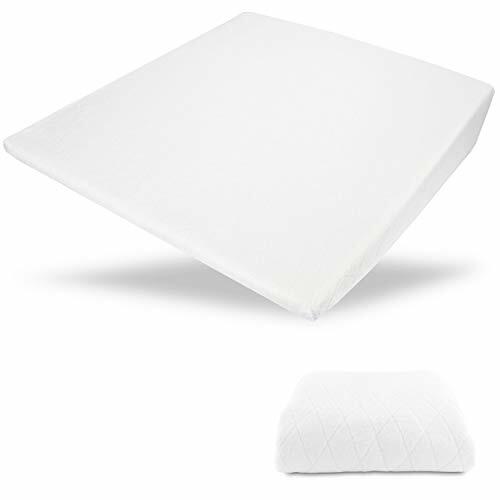 The top two inches will be this soft comfortable foam but the remainder of the 7.5 inch pillow is a high density polyurethane foam that will keep you upright through the night. Between these two layers are built-in channels that will provide you some ventilation and keep you from overeating as easily. For its size, this wedge is relatively lightweight, just over 4 pounds. It comes with a high-quality, removable cotton pillow case, but the manufacturer makes others you can purchase separately. (Because who has time to wash, dry and put away their laundry on the same day?) These pillow cases come in 400 thread count and are made with a bit more luxurious Egyptian cotton. 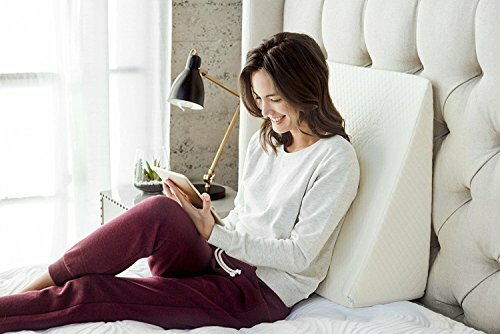 This pillow has over 1,300 customer reviews on Amazon, earning it a more than respectable overall rating of 4.1 stars. You can definitely make this purchase with a reasonable expectation of your satisfaction. For a pillow that will help ease the discomfort of pregnancy, try the OCCObaby Pregnancy Pillow Wedge. The OCCObaby Pregnancy Pillow Wedge has a removable cover, so you’ll be able to unzip it and toss it in the washer whenever you need. Propping this pillow beneath your belly can reduce swelling and help you sleep when you’re physically exhausted. And when your back is sore and you can’t find a comfortable position, this wedge slipped between your back and the chair can give you the support to keep upright. This pillow is double sided; you can flip and use either side depending on what type of support you’d like. On the top side, there’s a soft memory foam that you can sink into. You can place your growing second trimester bump on this side while you lay down for a bit of extra support. And then, when your belly has grown bigger than you ever thought it could, you can flip this pillow over for the more firm side to support the greater weight. You can pick this pregnancy pillow up for just under $30 and with the overall rating of 4.6 stars on Amazon and over 100 reviews, there’s a good chance you’ll be in the majority of satisfied customers, should you choose to buy this pillow. A wedge pillow can be good for a wide range of problems; from relieving to prevention. The biggest benefit for one, however, no matter what the motivation behind purchase, is to add to your comfort. If you struggle with reflux, a wedge pillow will allow you to use gravity as your ally to relieve those symptoms. That goes for the rare bout of reflex after a particularly spicy meal or for a more long-term diagnosis of GastroEsophageal Reflux Disease (GERD). Pregnancy can also cause discomfort when lying down, and whether it’s pregnancy related reflux or just the weight of your new belly, a wedge pillow can give the support to finally get into a comfortable position. Foam density. The higher the density of your pillow the less give it has. That means that the higher the density, the firmer the pillow. There may be some benefit to a lower density adding to your comfort level, but keep in mind a pillow that loses its shape won’t be “wedge” for long. Should a steep incline be what you need, a higher density will help you maintain that wedge. If you’re worried about too much discomfort, you may consider adding a soft pillow atop your wedge pillow. It’s vitally important though that you aren’t going to sink in too deep and suffocate yourself with pillows in your sleep, so be careful of over doing it. Note: It will be difficult to find the exact density on most wedge pillows. You’ll probably just find “low” and “high” density listed. Memory foam. Most wedge pillows will be a type of foam or a combination of two. Memory foam will evenly distribute your weight and return to its original shape once you remove the pressure. It will form to you and be exceedingly more comfortable to sleep directly on top. You tend to sink in a bit deep if the pillow is made entirely of memory foam, so wedge pillows tend to have a top memory foam layer and a firmer foam beneath. It is common to overheat while using a memory foam pillow as it doesn’t breathe especially well, so you’ll want to keep that in mind. There are several claims that memory foam can help with back and neck pain, but there are no scientific studies (as yet) to confirm that with certainty. Mostly, whether or not a memory foam helps with your aches or pains depends on your body and, unfortunately, you won’t know until you try it firsthand. Ventilation and cooling. As we just explained, foams tend to retain heat; and it’s not just memory foam. There are certain designs that act to create more ventilation but you have to plan ahead for this. Look for one that has some strategically placed holes (and keep in mind that means you will loose some firmness in the pillow) or those that use a cooling gel pad in conjunction. If you find later, after you’ve been using your pillow for a while, that you get overheated easily, you can make some purchases to mitigate the heat. There are pillow cases that will help stay cool all night long; bamboo is well known for that. Or you can just buy a separate gel pad to place atop the wedge, as well. Anti-snore. A wedge pillow under your head may very well help your partner get a better night’s sleep, too – by curing your snoring. It’s important to know upfront, going-in to your purchase that an anti-snore pillow does not work for everyone, though. However, you can make an educated guess whether it will work for you. It all depends on the cause of your snores, whether or not the wedge will help. If you’re a back sleeper or you snore only on your back, then there’s a good chance a change in position will help. If you snore in all positions all the time, we don’t recommend investing in an pricey pillow; it likely won’t work. Incline. As a rule, the more steep the incline the less comfortable you are long-term and it shouldn’t take too drastic an incline to relieve your pains or discomfort. A steep incline may be needed for occasional use – sickness and congestion or a bad bout of heartburn after a particularly spicy chili. But for daily use, you will probably want a more gradual incline. Especially if you sleep on your side. Is it good to sleep on a wedge pillow? It can be good for you to sleep on a wedge pillow. It will help you use gravity to provide fast relief to reflux (including GERD), heartburn and sinus or chest congestion. It can also improve your breathing which can help your oxygen levels, allowing you to get a more restful sleep and can eliminate your snoring. There’s also a decent chance that an inclined sleep, provided by the wedge pillow, will relieve some strain and pressure on some parts of your body and soothe some pains you have from overuse or injury. So if you have a bit of back or neck pain, sleeping on a wedge pillow may help ease that. What is the best height for a wedge pillow? The best height for a wedge pillow really depends on its intended purpose. The standard height range for a wedge pillow (lying on it’s “back” for sleep) is between 7 to 12 inches high. If you flip the pillow around and make the pillow tall, (better for sitting upright) you can expect anywhere from 15 to 30+ inches high. The longer the pillow is lying flat, the slighter the incline. What’s the best pillow to reduce snoring? Yes, it can. It isn’t an absolute though, so you’ll need to try it with very cautious optimism. If you just snore because you’re aging, are overweight, or are sick – then a wedge pillow may work wonders for you. The type of snoring matters. If you snore only in certain positions, there’s a good chance you can fix it with re-positioning and a wedge pillow is perfect for that. If you have a closed mouth snore, there’s a good chance there’s a problem with your tongue; open-mouthed snores tend to be related to your throat. If you snore only on your back, congrats! That’s the most easily “cured” and is likely going to be helped by a wedge pillow. Snoring in all positions, though, is a sign of something deeper at play. If your snoring is more closely related to an underlying health concern, there’s a good chance no pillow of any kind is going to help you. So if you try the pillow and it doesn’t work, it may be time to see your doctor. Do wedge pillows help with sleep apnea? A wedge pillow helping sleep apnea isn’t quite as likely as it is with snoring. Apnea isn’t going to be fixed with the re-positioning a wedge pillow can give, but it can be improved with the right one – sometimes. We can’t, in good conscious, claim it’ll help much, though. If you have sleep apnea that goes untreated for more than 5 years, your risk for dying in your sleep increases by 30%. You have a 2 to 3 times higher risk of a stroke and are more likely to have a heart attack. More likely to help is finding a doctor to prescribe you a CPAP. And with that does come specialized CPAP pillows. If you have apnea, best to go to the doctor right away; untreated it can definitely kill you and a wedge pillow is not treatment. We looked at 20 other wedge pillow. Even though they didn’t make our 5 best wedge pillow list, they’re the best of the rest and each is still a great option for you. The information you’ll need to compare each one is included with the listing. 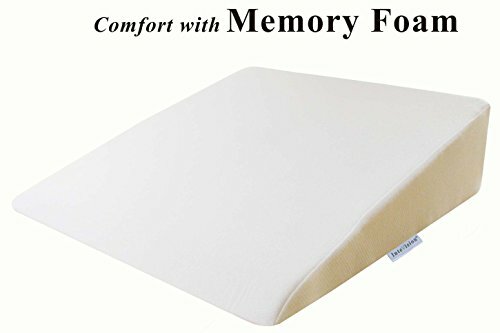 This 2-layer foam wedge pillow will allow you to sink in a bit with the soft memory foam top layer but not sink forever with a firmer foam base beneath that. This wedge pillow has a more slight incline but also includes a bonus neck roll for no extra cost. This pillow’s memory foam top will conform to your body for optimal comfort while the firm layer keeps you elevated just as you’d like. This wedge pillow will keep you inclined at a height of 12 inches; plenty to help with several potential health concerns. This wedge pillow can also convert into a rectangle block that can act as a soft step or a yoga block. This wedge is made without mercury, lead, formaldehyde, phthalates, or “tris” flame retardants so you can feel safe lying your head here. This wedge pillow is covered with a luxurious velour pillow case that is removable and machine washable. This large wedge pillow includes a machine washable, ultra-breathable bamboo pillow case that is also hypo-allergenic. This wedge pillow is 2-layered and comes with a quilted bamboo cover that will provide extra comfort along with superior air circulation. For a firm pillow that will let your thighs gradually raise and hold your feet elevated, this blue wedge will do just the trick. In you need to position your knees up but feet down, then this wedge will make sure you hold that position as you sleep. You can make sure your feet are elevated through the night with this wedge pillow as it supports your extremities and eases some back pressure. This pillow is a bit more narrow, making it ideal for a single leg elevation or if you’re sharing a bed after your injury. You can prop your belly on top this wedge pillow to support it while sleeping or support your back while sitting upright. While pregnant you will often feel like you have a heater attached to your front. Propping a cooling wedge under said heater is heavenly. This pregnancy wedge has its own removable cover in a fun color with a cute design of a heart atop. This pregnancy wedge comes with a travel bag so you can take it wherever you go. This pregnancy wedge is universal enough that you won’t just use it during your pregnancy; you can use it behind you while you sit or even as a head pillow to prop you up while you sleep. This is a perfect solution if you have a few health concerns you want addressed with optimal re-positioning. This set has everything you’ll need to re-position yourself; even if you don’t need it all right away, it never hurts to be over-prepared.